Payroll software for retail floral shops and independent florists that is very affordable and easy to use. Pay employees based on task such as floral design, sales, packaging, cleaning or delivery. Print paychecks with stubs. Run reports and file 941s/ W2s / 940s. Supports salary, hourly and per-piece payroll. Great reviews. For $119 only, process payroll for up to 10 shops with up to 75 employees per shop for one calendar year. When you operate a flower shop, you can be a part of some of the most important events in your customers' lives. Whether it is a wedding, funeral, birthday or other special occasion, your clients rely on you to provide the best floral services possible. Your employees also rely on you for timely and accurate payroll administration. As the owner or manager of a flower shop, you have a number of demands on your schedule. Payroll Mate® is a software solution that can help you to meet those goals while ensuring you have ample time to devote to managing and growing your flower shop business. • Payroll Mate® is a full payroll preparation software that supports Federal forms W-2, W-3, 940, 941, 943, and 944. Net pay, State and Federal withholdings, Social Security, and Medicare are automatically calculated for you. • With an additional cost add-on feature to Payroll Mate®, 1099 recipients can be supported. With this feature, you can pay and track your 1099 recipients, print comprehensive reports, and print tax forms at the end of the year. You can also use this feature to create non-payroll checks such as a vendor payment or a utility bill. • Payroll Mate® is never hosted online and is downloaded directly to your computer so you will never have to worry about your employee’s pertinent payroll information. This also ensures that data is always available to you anytime you need to access it. • Running reports becomes much easier with this payroll solution for your flower shop. Take advantage of the opportunity to run such reports as Payroll Totals, Deposit Requirement, Payroll Journal Details, Payroll Details, State Taxes, and more. Everything you need to understand your payroll is available with just a few clicks. • You can rest assured that regardless of whether you pay once a week, once a month, salary or hourly, you are covered with Payroll Mate®. Local city tax: If your employee’s are subject to paying a local city tax, you can easily create this and apply the tax to them in a few easy steps. Health Insurance Deduction: This can easily be created and tracked in your employee’s payroll checks. Do you want to provide your employees with a special bonus? No problem. This income can be created and applied to your employees. • Running a flower shop can come with a number of distinctive challenges. The last thing you want to have happen is to lose your payroll data. With Payroll Mate®, users receive a reminder to back up data to an external device that can be stored for safekeeping. This ensures that in the event of a natural disaster or a problem with your computer, your payroll data is always retrievable. • Security is assured with the option to password-protect the sign on for the system. Consequently, only those users who have the password can gain access. This helps to ensure that sensitive employee payroll data is kept secure and out of the wrong hands. • Need assistance with something inside the program? Friendly customer service is available by email, live chat, and phone. Built in tutorials provide you with detailed instructions on many aspects of the program. •	Signature ready checks are ready to print with a few easy steps. Pay stubs are also available for printing or emailing. •	Handling vacation and sick time accrual becomes a snap with Payroll Mate®. Choose whether you wish to have time earned on a per check basis or by the total amount of hours on a check and let the software handle everything else for you. It will even print time earned and time used on each pay stub. With all of the features supported by Payroll Mate®, you can ensure one of the most important aspects of running a business is taken care of. 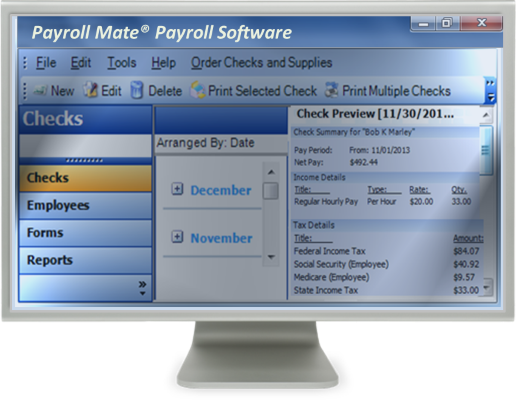 Payroll done with Payroll Mate® is easy, secure, and time effective.